Mr. Pate Marik, Director, Administrative Training Institute led 13 Officers of the APCS (EG) Lateral Entry 2017 Batch today visited Oju Welfare Association, Naharlagun as part of their Induction Training being held at ATI Naharlagun. The purpose of the visit was to sensitise the officers on community works and also to provide support to any people in need of help & assistance in their respective place of posting and link up with Oju Welfare Association for technical interventions and support. 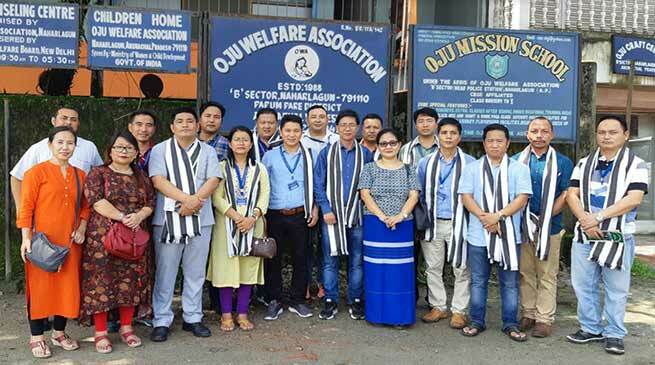 Mrs Ratan Anya, Chairperson, Oju Welfare Association, briefed the Officers on various activities being implemented by the Organization and physically visited the Women Help Line-181, Legal Aid Clinic, Vocational Training Unit, Sales Emporium, Swadhar Greh, Shishu Greh, Children Home and the Craft Centre. Mr. Pate Marik highly appreciated the noble endeavor and vision of the Founder Chairperson, Late Padmashri Awardee Dr. (Hon.) Binny Yanga. He further appreciated Mrs Anya for her efforts in carrying forward the vision commendably. All the visiting members were deeply touched and impressed by the noble service being rendered by the Organization. The Officers further committed to contribute towards the benevolent work of the Organization and acknowledge and appreciate it. The Team of Officers also donated some cash and fruits for the Children as a sign of their kind gesture.